Memorial Sloan Kettering researchers have reported a new method that could allow the development of more-specific, cell-based therapies for cancer. 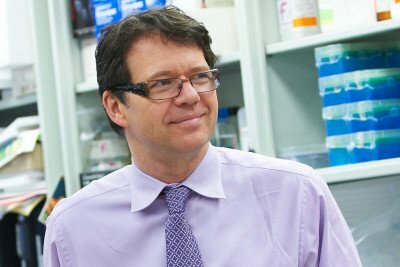 A team from Memorial Sloan Kettering has reported a new technique that could allow the development of more-specific, cell-based immune therapies for cancer. These types of treatments — which make use of patients’ own immune cells that have been enhanced in the laboratory — have shown some early success in the treatment of blood cancers including certain types of leukemia. For most cancers, however, cell-based therapies have been harder to develop, in large part because it has been difficult for investigators to train immune cells to attack cancer cells without damaging normal, healthy cells in the body. The treatment approach, known as adoptive cell transfer (ACT), involves engineering an immune cell called a T cell. Also called T lymphocytes, T cells are a type of white blood cell. They work by recognizing specific antigens — proteins on the surfaces of invading cells — and mounting an immune response against these invaders. In the ACT process, T cells are removed from a patient and a gene is added to allow the T cells to recognize a certain antigen on the surface of a cancer cell. The enhanced T cells are grown in the laboratory and then infused back into the patient to seek out and attack cancer cells. Cancer cells overproduce certain antigens, which can help T cells to recognize them, but those same antigens are often found in lower levels on healthy cells. “There are very few antigens, if any, that are found only on cancer cells,” Dr. Sadelain explains. This means that T cells engineered to recognize a certain antigen could attack normal cells that have that same antigen as well. The new technique makes use of two kinds of receptors: chimeric antigen receptors (CARs), which allow T cells to target antigens on the surface of a tumor cell, and chimeric costimulatory receptors (CCRs), which allow T cells to recognize a second antigen. In the study, which was published online December 16 in Nature Biotechnology, the team created T cells that carried receptors for two antigens found in prostate cancer cells: a CAR for an antigen called PSMA and a CCR for an antigen called PSCA. The investigators then generated mouse models of prostate cancer and infused the mice with the engineered cells. They found that the T cells attacked only tumors that carried both antigens. The study’s first author was Christopher Kloss, a graduate student in the Weill Cornell Graduate School of Biomedical Sciences who is a member of Dr. Sadelain’s laboratory. This work was supported by philanthropic funds provided by Mr. William H. and Mrs. Alice Goodwin and the Commonwealth Foundation for Cancer Research, The Experimental Therapeutics Center of Memorial Sloan Kettering Cancer Center, The Major Family Fund for Cancer Research at Memorial Sloan Kettering, Mr. and Mrs. Joel S. Mallah, and Mr. Lewis Sanders. from May to Nov 2011; 4 times (every 12 weeks) in 2012. and am scheduled for 5 more appointments (again every 12 weeks) in 2013. I feel absolutely great and hopefully the research is being shared within the cancer research community. I would be more than happy to provide any details. Anyone studies of Immucin in the US? I was treated in 1992 with immunotherapy, in a phase II study with IL2. My sister was diagnosed with liver cancer 2 months ago and is undergoing chemotheraphy treatments. However, she having a lot of difficulty with the side-effects and what's worse is that they won't tell her how long the treatments will continue. In the meantime, she gets nausea & vomiting from the morphine pills she has to take for the pain and consitpation which doesn't allow her to eat well. She also has swelling in her leg. She's not any worse, but she also not feeling any better, so we're at our wits end here. We encourage you to discuss these concerns with your sister’s healthcare provider. Thank you for your comment. Does the research have any relation to the immunologic research being funded by the NCI and managed thru the Fred Hutchinson Clinic based, to a degree, on the original but ancient work of Dr Coley in 1890's at MSK? engineered T cells as a potential treatment for cancer. Memorial Sloan-Kettering is a leader in the design of chimeric antigen receptors and other related strategies, as exemplified in this latest paper. Thanks for your comment. I would like to know if this new research would be useful to patients with multiple myloma, which is also a cancer of the blood. We spoke with Dr. Sadelain, and he says, “The principle described in this paper is indeed applicable to many tumor types, including myeloma. Myeloma happens to be one of our priorities, although we are not yet funded to proceed with it.” Thanks for your comment! I have been told by my local endocrinologist that the nodules on my thyroid gland can be ignored regardless of the fact that they have increased from 2 to 8 in the last year, since biopsies are all negative for cancer. Two are large and a bit uncomfortable.. so am I wrong to be concerned,? I have Hashimotos, disease and on synthroid for the last 2O years.. Do I need a second opinion? Thank you for your comment. Unfortunately, we are unable to answer personal medical questions on our blog. If you’d like to make an appointment for a second opinion at Memorial Sloan-Kettering, please call 800-525-2225. My sister was diagnosed with Uterine Leiomyosarcoma and had several surgeries, then chemo with two combined drugs (recommended by Sloan-Kettering). Upon recurrence and after more surgery, she is now on Trabectedine (Yondelis from PharmaMar) and the tumor is stabilzed, but side effects are very hard on her. Any hope from Immunotherapy? Any other suggestions are appreciated! Thanks! Thank you for your comment. Unfortunately, we are unable to answer personal medical questions on the blog. We encourage you to speak with your sister’s physicians at Memorial Sloan-Kettering about this question. We spoke to Dr. Sadelain, and he said this approach potentially could be applied to sarcomas, but Memorial Sloan-Kettering does not have an active program in that area at this time. The National Cancer Institute does have a trial open for certain sarcomas. Thanks for your comment. Would this approach work for mesothelioma? Thank you for your comment. This research is still in the early stages, and it is too soon to know which cancers it may be successful in treating. Since this original article, have any trials been initiated or are any in the works to try designer T cells in advanced prostate cancer? Thank you. Thank you for your comment, Andrea. We have recently opened a clinical trial for patients with prostate cancer: http://www.mskcc.org/cancer-care/trial/09-036. Are there any plans to try this treatment with metastatic ocular melanoma? My daughter has Stage 4 and we are obviously looking at trials. My (uninformed but energetic) research indicates that ocular melanoma has some unique genetic properties. Basil, we consulted with MSKCC physician Judd Wolchok, who informed us that the National Cancer Institute has an adoptive cell transfer protocol for ocular melanoma. To learn more about this trial, you can call the National Cancer Institute’s Cancer Information Service at 800-4CANCER (800-422-6237). I have had two Liposarcoma tumours removed since November 2008, when a large tumour was removed from my left lower abdomen and upper thigh, followed by 30 daily radio therapy sessions, the second was a recurrence a little further back but it was mixed up with my Femoral artery and nerve, both of which were removed with the tumour. The artery was replaced with some vein taken from my right thigh but the nerve is gone and I am now not able to move my lower leg forward from the knee. I now have a third recurrence which is still further back close to the inside of my left rear pelvis, I am advised that surgery is not an option as it would cause more problems than leaving it were it is. I have had five cycles of 150 mg of Doxorubicin, which has helped stabilised the tumour and relieved some of the nerve pressure but not removed it. I am now looking forward to more Chemotherapy but as yet do not know what it will be. I wish to offer myself as a volunteer should you require any, I am nearly 73 so have had the best of my life and hopefully what's left could be useful to future cancer sufferers. I have read that it is hoped to carry out T-cell trials for lung cancer next year. Is this just for small-cell cancers or for others? My wife has a non small-cell cancer (EFGR mutation) and has been taking gene therapy for about 2 years (Gefitinib). We understand that the tumour is likely to mutate further, making Gefitinib ineffective. Are the proposed trials likely to be relevant here? Jon, we are looking into this and hope to have an answer for you soon. Thank you for your comment. Hi, Jon. We sent your question to Dr. Sadelain, who responded, “We are planning a trial utilizing CAR-targeted T cells in non-small cell lung cancer in patients whose tumors express mesothelin. The trial will open in 2014 if all preparations go well and advance swiftly.” Thank you for your comment. Will there be any trials for mestasais of the lungs due to Osteosarcoma? My 17-year-old son has done first tier 4 drug chemo, then gemcidabine and abraxane. But nothing has helped. We did DNA testing with Foundation One and he has a TP 53 mutation along with a TSC mutation. So he now is on rarapune and Sorafaneb. He is a strong kid and a fighter. Thank you! Donna, unfortunately we are unable to answer specific medical questions on our blog. If you would like to make an appointment with a Memorial Sloan-Kettering physician, please call our Physician Referral Service at 800-525-2225 or go to http://www.mskcc.org/cancer-care/appointment. Thanks for your comment. How is a diagnosis of multiple myleoma definaely diagnosed? Is a bone marrow biopsy the only conclusive form to verify this type of cancer. I have shown to have had collapsed vertebraes at T6-T7 and a lab report showing neoplasticgammothy of undetermined cause (MGUS). Thank you. Has there been progress with regards to immunotherapy potentially working on leioomyosarcoma? Are there clinical trials we can sign up for? Majlinda, MSK currently has two trials underway for leiomyosarcoma, but neither of them involves immunotherapy. You can see a list here: http://bit.ly/1ou6cdi You might also want to check the National Institutes of Health’s clinical trials database at www.clinicaltrials.gov. If you’d like to make an appointment to speak with a sarcoma expert at MSK, you can call 800-525-2225 or go to http://www.mskcc.org/cancer-care/appointment for more information. Thank you for your comment.